The National Transportation Safety Board determined that the probable cause of the crash of an experimental Gulfstream G650 jet on April 2, 2011, in Roswell, N.M., was the result of an aerodynamic stall and uncommanded roll during a planned takeoff test flight conducted with only one of the airplane’s two engines operating. The Board found that the crash was the result of Gulfstream’s failure to properly develop and validate takeoff speeds and recognize and correct errors in the takeoff safety speed that manifested during previous G650 flight tests; the flight test team’s persistent and aggressive attempts to achieve a takeoff speed that was erroneously low; and Gulfstream’s inadequate investigation of uncommanded roll events that occurred during previous flight tests, which should have revealed incorrect assumptions about the airplane’s stall angle of attack in ground effect. Contributing to the accident, the NTSB found, was Gulfstream’s pursuit of an aggressive flight test schedule without ensuring that the roles and responsibilities of team members were appropriately defined, sufficient technical planning and oversight was performed, and that hazards had been fully identified and addressed with appropriate, effective risk controls. During takeoff on the accident flight, the G650 experienced a right wing stall, causing the airplane to roll to the right with the right wingtip contacting the runway. 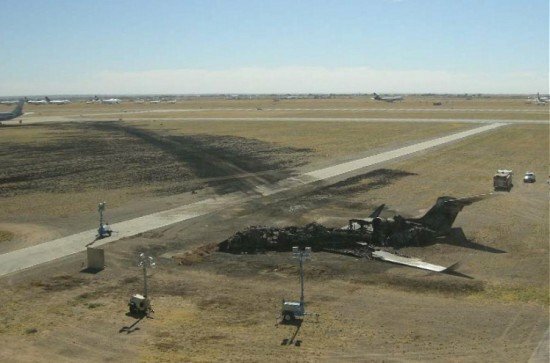 The airplane then departed the runway, impacting a concrete structure and an airport weather station, resulting in extensive structural damage and a post-crash fire. The two pilots and two flight engineers on board were fatally injured and the airplane was substantially damaged. The NTSB made recommendations to the Flight Test Safety Committee and the Federal Aviation Administration to improve flight test operating policies and encourage manufacturers to follow best practices and to coordinate high-risk flight tests. And the Board recommended that Gulfstream Aerospace Corporation commission an independent safety audit to review the company’s progress in implementing a flight test safety management system and provide information about the lessons learned from its implementation to interested manufacturers, flight test safety groups and other appropriate parties.